Roll through the messiest conditions in total confidence. 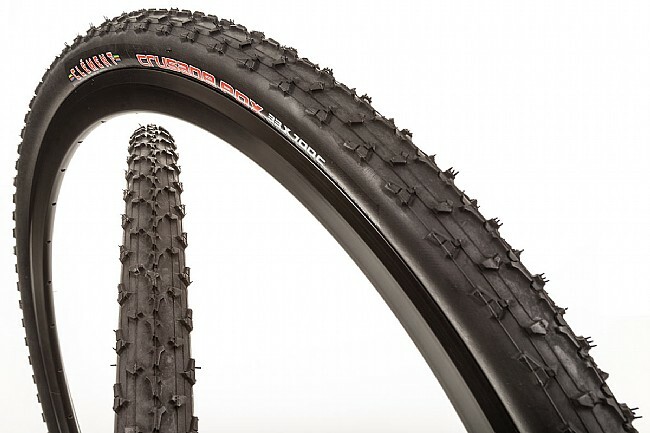 Named after the Cross Crusade right here in Portland, Oregon, the largest-participation cyclocross series in the World, Clément's Crusade PDX Cyclocross Tire is an all-around performer with a particular love for mud. Tightly spaced center knobs ensure fast rolling on hard pack and pavement, in wet or dry conditions. Side knobs offer superior edge control so your bike stays under you—where it belongs. The leading edge of the knob gives you extra traction coming out of corners as well. Available in standard clincher and tubeless-ready models.120 TPI casing. 45-75 recommended PSI. Folding bead. 700c x 33 (UCI legal; 33-622 ISO). 350 grams. love, love, love this tire. works well in the dirt, grass and mud. Good mud and gravel tire. Corners well and hooks up on mud. It wears fast, especially if you ride it on pavement but it's a great all around tire. Solid all around tire, excellent mud tire! I would use this tire in 80% of the conditions a cross racer would find out there, and probably 95% of the ones we'd encounter out here in Oregon. It runs fast on straight line hardpacked dirt and pavement, but really excels in the mud. The PDX sheds mud easily, doesn't pack, and is well suited to off-camber, slippery courses. The only time I would not recommend the tire is a really sandy course with lots of firm, fast turns. Otherwise, great product and certainly a tire I would buy again.